What does this store have? We sell more formal, prom, and evening gowns to the Savannah region than anyone else, and for good reason! Our buyers bring the latest trends to our area by giving you a contemporary look with southern style. Want to see the best prom dresses from online? Each location is stocked with the most popular prom dress styles. Visit or contact the nearest location for dress availability and get the dress of your dreams! We carry all of the newest designs from southern clothing fashion brands like Judith March, Everly, and Hourglass Lilly. Hi, my name is Marlie, the manager of our Savannah area store! I was a customer of Genealogy's before getting a job as a sales associate during my junior year of high school. Being that I am a local resident, and a graduate of South Effingham High and Georgia Southern, my passion is helping girls in our area find their perfect prom, pageant, or any other formal event dress! Customer satisfaction is what we care about most! If you have any problems with our store, our products, or our employees, please call and ask for me so I can address any issue you might have! Wait really? Yup! The view is about a year old, but it will give you an idea of what it looks like to walk around the store! We are a military family owned small business with three retail stores in North Carolina, South Carolina, and Georgia. We also have an internet business that ships formal wear to all 50 states and internationally (on most brands). In 2019 we will have over 30 employees that will help tens of thousands of women at all ages find their dream formal gown, shoes, and accessories. Read More We hope your experience with us is a positive one! If you have any negative experiences with us in-store or online, please let the owner know. Our knowledgeable staff invites you in and makes you feel as though you are a part of our family as they custom tailor your experience by offering guidance through all of the fashion events of your life. Whether you are looking for an exclusive piece of formal wear or the trendiest, boutique clothing, Genealogy in Savannah has it all for you! When it comes to style, we here at Genealogy Dresses are always up to date on the latest fashions and receive new stock daily! We have the best of the best here in our Pooler store and are always on top of the latest trends. From Judith March, to Hourglass Lilly, to Karlie, and game day dresses, we know what women here in the South love to wear. Fans of all of the local gameday colleges, the University of Georgia, Georgia Southern, Georgia State and the Savannah School of Art and Design, we love to outfit all of our college girls! We have the perfect outfit for tailgates and home games, sorority formals, and even nights out with the girls! And for those military wives and girlfriends, we have the perfect military dresses. With plenty of passion for fashion, industry know-how, and dedication, Genealogy is here to serve you, our customer and our friend. The designers we work with are constantly creating new styles and send us only their most exclusive dress pieces. After making a name for ourselves and really getting to know our clientele, we have come to realize what you want! We love prom dresses in the spring and game day dresses in the fall. 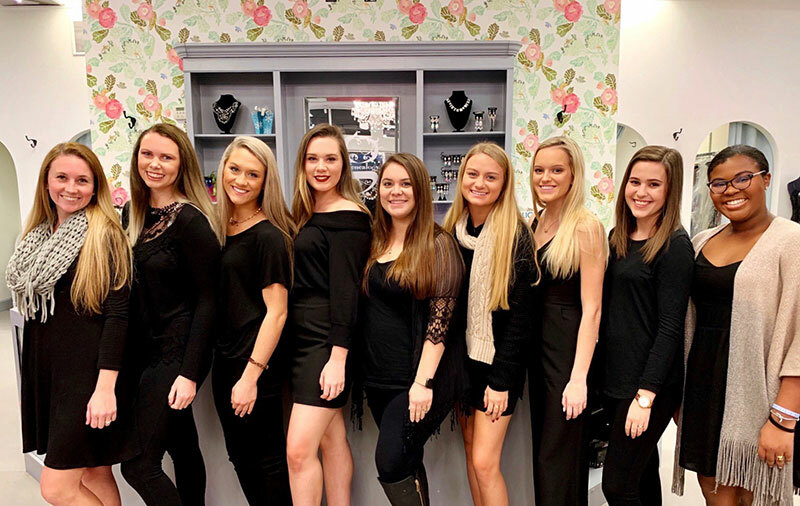 We at Genealogy Boutique and Formals are here for you to make sure that we are constantly stocked with clothing and accessories you just can't wait to bring home to your own closet! Aside from our exciting and robust collection of clothing and accessories, we offer the best assortment of formal dresses, worldwide. For a prom, pageant, homecoming, military ball, or any other formal event, the Genealogy staff is here to help you find the dress that is absolutely perfect for your unique body type and personal style. Come into our first and finest boutique and you will immediately feel inspired to find the dress of your dreams. Not only do we have gorgeous designer gowns, we also offer a dazzling assortment of Swarovski Crystal jewelry, the latest and greatest in prom and pageant shoes, and all of the must-have undergarments to make you really shine on your big night! Not only is Savannah home to one of the most adorable boutiques in the Southeast, it is also know as the home of all St. Patrick's Day celebrations! This most festive and can't-miss event includes pageants, parades, parties, and so much more. You have to see it to believe it! And no matter where you're headed, we have what you need to be the best dressed girl there! Whether it's a fun top for Friday night, or the ball gown of your dreams, Genealogy of Savannah is here for you! 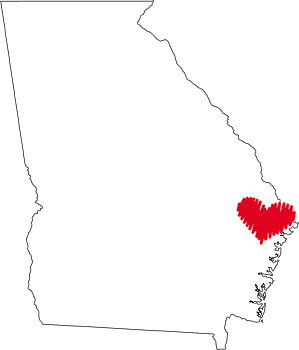 We regularly service women from Hilton Head Island, SC, Bluffton, SC, Richmond Hill, GA, Statesboro, GA and of course, Pooler, GA. Girls looking for prom dresses in Statesboro, GA will be pleased to see our exceptional selection. If you are looking for prom dresses in North Charleston, come across the bridge and visit our Mount Pleasant store. So stop on in and check out the latest and greatest in women's fashion. We're open seven days a week and look forward to meeting you! Click the "directions" icon on the map below, or check out our written directions from local employees on the best way to get to us! Take exit 104. Take a right off the exit ramp. Go about 1 mile and turn left onto Park Avenue. We are in The Pooler Marketplace on the left, next to Firehouse Subs in the Publix shopping center. Take exit 104. Take a left off the exit ramp. Go about 1 mile and turn left onto Park Avenue. We are in The Pooler Marketplace on the left, next to Firehouse Subs in the Publix shopping center. (Statesboro, GA) Take exit 155 toward Savannah/Hilton Head/Pooler/International Airport. Turn left off ramp onto Pooler Pkwy. Drive 4.2 Miles. Turn right at stop light onto Park Avenue into the Publix shopping center. We are next to Firehouse Subs.